Multidimensional coevolution, no oscillation overthruster required « Nothing in Biology Makes Sense! The model: While I’ll leave it to you to check out the full supplemental information for the details of their model, it is firmly rooted in the quantitative genetics framework of Lande land (Lande 1979; Lande and Arnold, 1983). As such, evolutionary change is measured by how selection changes the variance/covariance structure (G-matrix) of the underlying traits. The analytical model assumes a fixed G-matrix, however their simulations relax this assumption. The primary goal of the analysis is to calculate the ability of the victim/host to escape the exploiter/parasite measured as the maximum evolutionary escape rate. This evolutionary escape rate is the difference in the rates of change of the host defense traits compared to the parasite attacking trait. When the host is winning host it is said to be outrunning the parasite. Key point: As the number of interacting traits increases, the chance of the host escaping increases. The reason this is true is that the host has to escape the pathogen in only one trait at a time. On the other hand, the pathogen has to track and overcome all of the host defenses. To supplement their analytical findings, the authors also run individual based simulations which are consistent with their analytical results. One of the nice things about these simulations is that they remove the assumption that the G-matrix doesn’t evolve. The authors note that the G-matrix does evolve during the interaction between host and pathogen. When the interaction is based on the difference of the traits between host and pathogen, coevolution generates negative correlations. Correlations can affect the ability of the host to escape the pathogen. Generally, negative correlations among host traits would constrain evolution, but as the dimensionality of the traits increases the negative correlations decrease. This paper was eloquent in its intuitive simplicity. The authors address an interesting question and provide enough of the model details to understand the results. It is definitely worth your time to read. 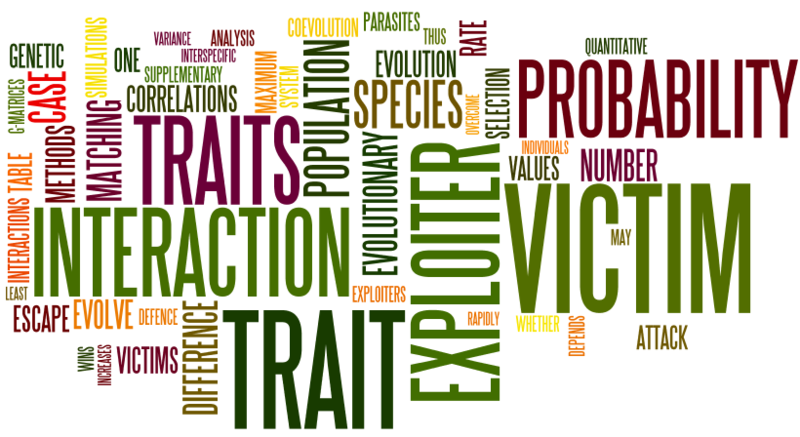 This entry was posted in coevolution, parasitism and tagged coevolution, community, host-parasite, theoretical.